Wow! Looking at my new prosthesis in the mirror and I cannot believe how it blends with my face. The colors are a perfect match and it fits so well I cannot see where it starts and my actual face ends. And even better, you did this without me having to pay to travel to your office in Madison. As simple as sending you pictures from Florida compared to samples you sent. Unless you are a person that has lost part of their body, it is impossible to know the feeling of being able to be in public with a replacement that fits and blends so perfect. After the surgery that removed my nose due to sinus cancer, I felt that I would spend the rest of my life either hiding from the public or facing constant stares while living my daily life. I go about a normal life in public without any concerns due to you and your skillful and caring service. And as a bonus it was done long distance. I cannot thank you enough. After discovering that Dr. Burget in Chicago did not accept Medicare, I accepted his recommendation to see Dr. Fred Menick in Tucson. In June, I had the first surgery: replacing the floor of the nostril–usually not necessary when the basal cell is on the nostril itself. After discovering that Dr. Burget in Chicago did not accept Medicare, I accepted his recommendation to see Dr. Fred Menick in Tucson. In June, I had the first surgery: replacing the floor of the nostril–usually not necessary when the basal cell is on the nostril itself. Anyway, then, I got an amazing pedicle along with the new nostril. That was in July and when I retuned to get the pedicle removed, there had been an infection that delayed its removal for several weeks. I have not had four surgeries and will return in March for the finishing-up one: restoring my smile line on that side, thinning the nostril and shaping up the alar. 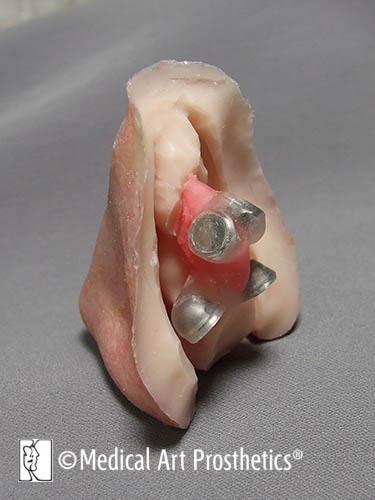 Both he and Dr. Burget were impressed with my prosthesis, and both told me the outcome would not be that good. That is true, but it is quite a relief not to have to think about adhesives, etc. Both asked for your contact information. I am attaching some photos–of the pedicle and of how I look now. Thanks for taking care of me for nine years. In December of 2006 I was involved in a very serious motor vehicle accident. I had several broken bones and spent two weeks in a coma. The most significant damage was the loss of my nose. Broken bones heal, but this was very permanent. 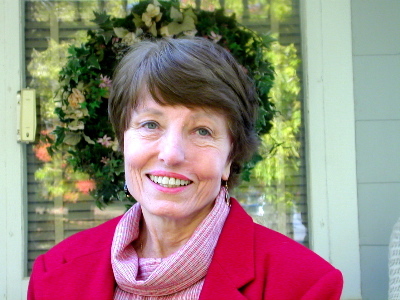 In December of 2006 I was involved in a very serious motor vehicle accident. I had several broken bones and spent two weeks in a coma. The most significant damage was the loss of my nose. Broken bones heal, but this was very permanent. A microvascular surgeon did try to reattach it. However, the attempt was not successful. 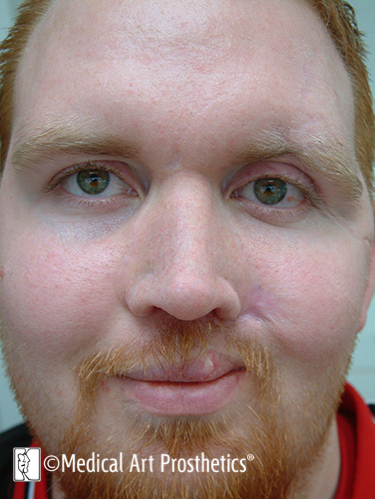 After getting over the shock of a part of my face being missing, I began to start the process of regaining what was lost. We met with two plastic surgeons and both agreed the damage was too great to repair surgically. My wife began to research other avenues; she came across the web site for Medical Art Prosthetics, and printed off the pictures to show me. When she first told me about it I was very skeptical. Then she showed me the pictures and I could not believe my eyes. It did seem very strange to have someone make me a nose, but I was willing to look into it. I met with the plastic surgeon one last time hoping his opinion had changed, but still he thought a prosthetic would be best. I asked him for a reference and he said he had seen Mr. Gion’s work and was very impressed. 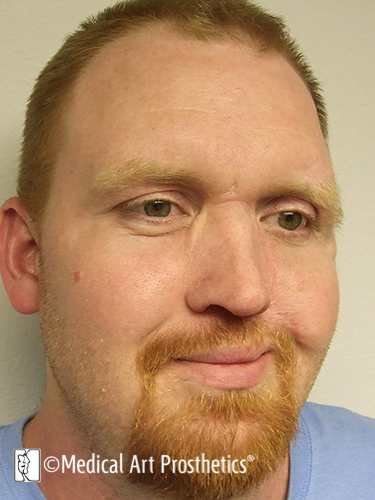 I trusted him and knew the next step was getting in contact with Medical Art Prosthetics. After speaking with Mr. Gion’s partner; clinical anaplastologist Allison Vest, we made the appointment to fly down to Dallas. Our first appointment they showed me the types of product they use and explained the whole process. We decided this was going to be the route we would take. In that same trip we met with Dr. Ellis to talk about getting magnetic implants put in to hold the prosthetic on more secure. Mr.Gion and Dr. Ellis agreed I was a candidate for the implants. The next trip was to make the impression. 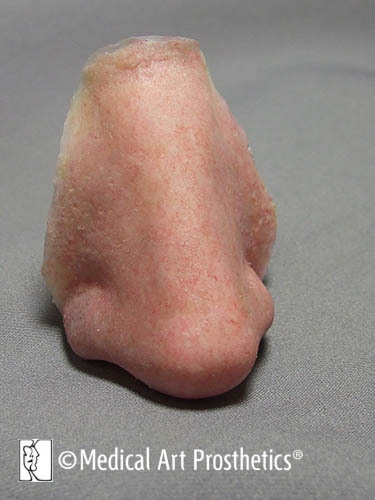 He also made a wax nose to give me some idea of what it would look like. That sealed the deal. I was amazed at the wax model; I could not imagine how good the final silicone product would look. As soon as we could we scheduled the surgery to have the implants put in. Recovering from the surgery took about two days. Then we had to wait. It takes three months to let the magnets set in the bone. Right at three months we went down again to finish the process. Dr. Ellis agreed the magnets were secure and Mr. Gion began perfecting the prosthetic. This process took about a week. We spent several hours getting the coloring and shape to be me. Mr. Gion made sure I was 100% satisfied before we flew home. Flying home was a totally different experience; my self confidence had been restored. When we got home it was Christmas time, and my family was beyond words. I have since then gone back to my active life style and I enjoy life again. I am very grateful to Mr. Gion, Ms. Vest and Medical Art Prosthetics for giving me back something no one else could. 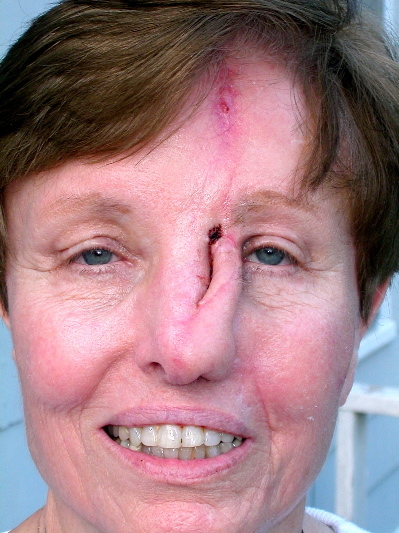 Ernie S. from Illinois wears a 2-piece magnetic nasal or midfacial prosthesis. 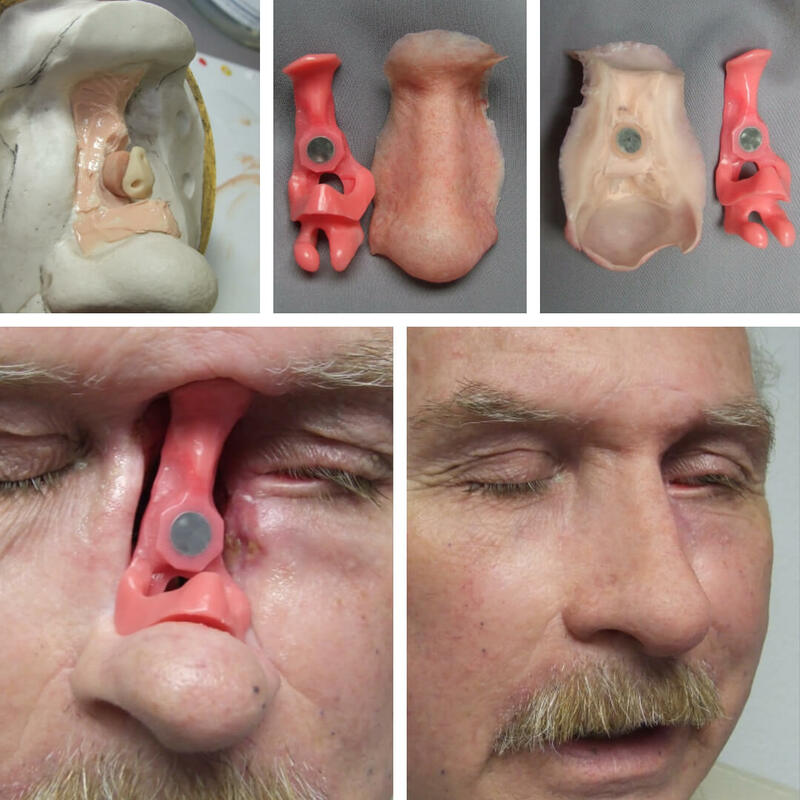 Restoring the nose with prosthetics is a challenge, because patient’s rightfully expect a perfect color characterization and manageable attachment system. Our patient has received a unique prosthetic system proven to be a success, evidenced by his return for the techniques we offer that his local anaplastologist/prosthetist could not. 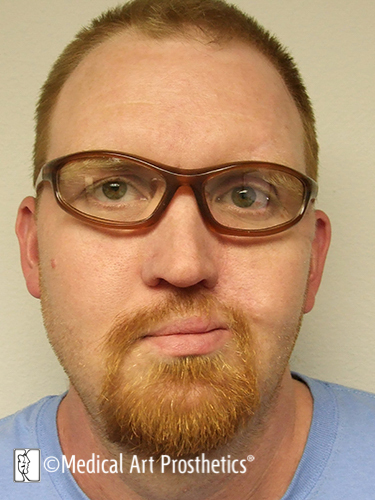 Ty F. from Illinois wears a small nasal prosthesis. 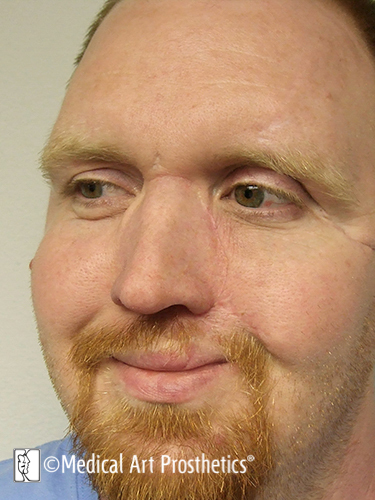 We would love to hear about your nasal prothesis from Medical Art Prosthetics.